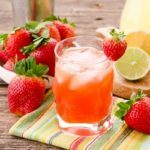 Strawberry Whiskey Sour is a fruity twist to a classic cocktail. Homemade sour mix and fresh strawberries make it over the top. Add water and sugar to a small saucepan. Bring to a boil and cook until sugar dissolves. Remove from heat and add lemon and lime zests. Cool to room temperature. Add lemon and lime juices. Strain through a fine mesh sieve. Cover mix and chill thoroughly. Stir together strawberries and granulated sugar in a bowl. Chill for at least 2 hours. Place strawberries and juice in a blender. Blend until completely puréed. Strain through a fine mesh sieve to remove as many seeds as possible. You may have to push purée through the sieve using a spoon or rubber spatula. Add whiskey, sour mix, and strawberry purée to a cocktail shaker filled with ice. Garnish with fresh strawberry, lemon slices, and/or lime slices. Keep both leftover sour mix and strawberry purée chilled in sealed containers. Use sour mix within 7 days. Use purée within 3 days (great in smoothies). Prep time does not include time for cooling and chilling sour mix or macerating strawberries for the purée.